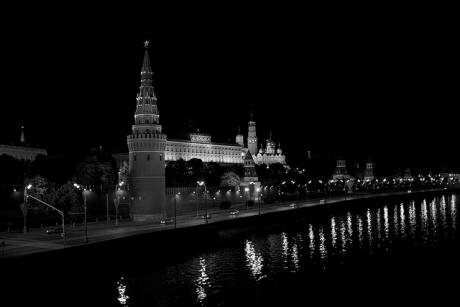 Staring at shadows: Moscow’s Kremlin at night. CC: ePsilon / Flickr. Some rights reserved.Writings on contemporary Russia are mostly variations on the same subject: Vladimir Putin; his rise to and iron grip on power. Western journalism and punditry on the state of the country is no different. Even when the subject isn’t explicitly Putin, Russia’s “first person” is inevitably the ultimate focus. This focus is evident even in the ways “Putin” functions as both a possessive noun and metonym — “Putin’s Russia”, “Putin’s Kleptocracy”, “Putin’s Wars”. It’s as if unlocking the secret to Putin will reveal the truth of Russia. It’s understandable why Kremlin intrigue tickles most analysts’ fancy, but examining today’s Russia “from below” bears untapped analytical promise. At a time when Russia’s liberal opposition is at a low, other forms of grassroots political activity, particularly around social and economic issues, are experiencing a new lease on life. A recent report by the Center for Economic and Political Reform finds that in the second quarter of 2016, there were 263 labour related protests in 65 of Russia’s 85 regions, up from 229 in the first quarter. The majority of these protests (171) are related to perennial problem of wage arrears. Unlike opposition protests in the capital, these incidents garner little attention, even in Russia’s federal press. Most are local, are aimed at employers, minigarchs, real estate developers and local officials, and rarely gather enough steam to capture federal attention. Nor are these actions explicitly against Putin. In fact, most supplicants strategically appeal “to the president” as a means to draw recognition (and perhaps even a resolution) to their plight. If a Russian shouts in the woods . . . Surprisingly, unlike when Russia’s liberal opposition rears its head, the activities of Russia’s “simple people” remain underreported and underrepresented in our narratives. For the most part, our understanding of the country remains relegated to high politics and “top down” analyses. Books and articles on Russian society (unless you dig into the bowels of university press catalogues or academic journals) are few and far between. Our Moscow-centric, Kremlinological myopia shrouds Russia’s social complexities. Issues such as class, ethnicity, culture, sexuality and gender, let alone the prismatic mosaics of daily life outside the capital, are flattened or configured in relation to their approval or dissatisfaction with Putin. A grassroots politics is brewing in Russia. How much longer can we remain deaf to its voices? When Russia’s “simple people” are represented, their life and mentalities tend to be mediated through figures and percentages processed through social scientific methods of quantification. These numbers are usually used to measure the extent the “public mood” intersects with or diverges from the Kremlin line. Or worse, the “simple people” are portrayed as passive, apathetic, or “zombified” by Kremlin propaganda, neutralised by its “nostalgia” for the Soviet past, or hamstrung by the tenacity of its “sovok” or Soviet mentality. Anastasia Gordienko protests the treatment of Russian farmers and of her family, Omsk Region, 2015. Image courtesy of Georgy Borodyansky.When analysts ascribe society’s agency in Russia, it is often couched as “civil society”. This synonym for Russia’s urban — read Moscow and St Petersburg — liberal, and westernising vanguard is inevitably juxtaposed against a totalising Russian state and Russia’s retrograde masses. Indeed, since the collapse of communism, “civil society” has been fetishised as a revolutionary subject that, unlike its baser lumpen siblings, is the measure of civility itself. Thus, we often hear of the struggle for the civil — free speech, assembly, rights, and franchise. Material rights — the economic and social — are often sublimated into the civil, snubbed as “populism”, or silenced altogether. Over the past year, Russian truckers, farmers, miners, auto workers, and regular citizens have come together to fight for economic and social justice. What’s crucial about these actions is that they are not only birthing new organisations like the Association of Russian Carriers (OPR), but their participants are beginning to form solidarity across their respective struggles. When Krasnodar’s “Polite farmers” (an pun on the unmarked Russian forces that took Crimea) it set off in late August to Moscow in their tractors, only to have their convoy blocked by the police and their organisers arrested, truckers hopped in their rigs to lend support, only to get detained as well. The truckers have also reached out to hunger striking miners at the Gudkovo mine near the city of Rostov in southern Russia. These actions have provoked a curious response on the editorial pages of the Russian press: The Russian people are suddenly the target of repressive methods previously reserved for activists involved in the violent clashes at the Bolotnaya square protest in 2012 and oppositionists from the creative class, Russia’s young (and uppity) middle class urbanites. 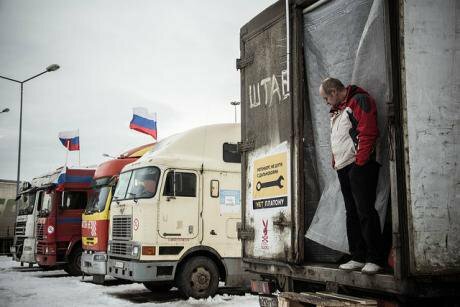 Life in the Russian truckers’ protest camp outside St. Petersburg, February 2016. CC: Farhad Sadykov / Flickr. Some rights reserved.The authorities’ reaction to social protests demonstrates a distinct shift from 2012, revealing the exhaustion of the patriotic surge after the annexation of Crimea. Back then, in the wake of Russia’s parliamentary and presidential elections, the Kremlin touted the “simple people” from Russia’s provinces as the “silent majority” which served as the backbone for Putin’s re-election. Now agents from Centre E, Russia’s anti-extremism agency, arrest tractor march organisers like Aleksei Volchenko at his home and the courts hand down five to ten day jail terms for participating in an unsanctioned protest. The police threaten the teenage sons of “simple people” like farmer Oleg Petrov, another organiser, for joining his father in the march. The FSB searches а farmer’s home. Tax inspectors investigate а farmer’s relatives. Yet, in so many ways, we are still at square one where politics is regarded as the contest of great men. The formidable challenge the Kremlin’s increased opacity presents, Russia expert Anders Aslund says, “has opened a window of opportunity for Kremlinology to make a comeback.” But what is this Kremlinology and why do we need it? There’s that metonym again — Russia is closed because the Kremlin is opaque, and the Kremlin is opaque because Russia is closed. The Kremlin equals Russia, and Russia equals the Kremlin. Lost in-between is, well, everything. There’s no need to peer between the lines of the equal sign because to do so will only reveal an irrelevant void. 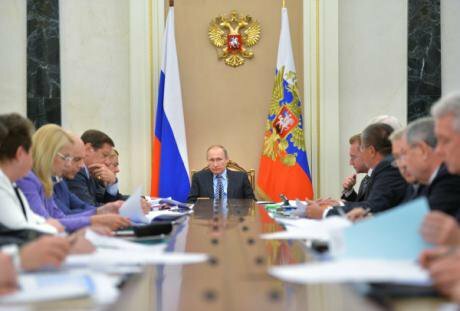 Vladimir Putin holds a meeting of the Presidential Economic Council on 25 May 2016. (c) Alexei Druzhinin / VisualRIAN. All rights reserved.The methods to this “art” are simple: substitute Lenin’s Mausoleum for a council table and start measuring the planets’ distance from the sun. Two seats from Putin — you’re in. Five seats — you’re out. One seat — a dauphin in becoming. At least until he’s down the table or out of the room. Call it the political science of musical chairs. I am not arguing for a total rejection of Kremlinology. I simply urge us to recognise its limits. The real opportunity the Kremlin’s opacity offers is not doubling down on soothsaying and seating chart analysis, but shifting gears altogether. The locus of power may emanate from central Moscow, but the application of that power on Russians and their resistance to it is localised. The goal, it seems to me, is to craft an analysis of Russia without Putin — a fracturing of the metonym — which accounts for the immediate localised flows of power most Russians’ experience. This is not a call for ignoring the power vertical’s trunk, but a focus on its more malleable branches, twigs and leaves. As Russia’s welfare state constricts, more Russians are realising they’re paying more for less. And while the Tsar is far away, his stewards sit down the road. Depending on the region, pressuring local officials can produce results more often than twisting Moscow’s arm. Reading Kremlin photo-ops like tarot cards will illuminate none of this. Russia’s “silent majority” has never been truly silent. We diagnosticians of Russia’s present just aren’t really listening. Interested in learning more about grassroots protest movements in today’s Russia? See sketches by Russian artist Viktoria Lomasko here, featuring the Russian truckers’ protest and the battle to save a popular Moscow park.